Casement windows are versatile windows that can transform your Chicago home in many ways. With a crank out operation, casement windows provide your home with excellent ventilation but also have wonderful energy efficient features. Your Chicago casement windows from Feldco offer simple and reliable functionailty. They’re designed with a single hand crank that’s easily accessible in even the hardest to reach places like over your kitchen sink. You can have your replacement casement windows in Chicago either swing open to the left or the right. You can also customize the grid style and the finish. Plus, the casement handle lays flush to the window frame giving your window a sleek design and eliminating any interference with your blinds, curtains or other window treatments. Feldco casement windows will allow your Chicago home breathe better because they have a wide range of motion allowing you to open them as much or as little as you’d like. Along with increased ventilation, casement windows will provide your home with increased natural light with their open design. 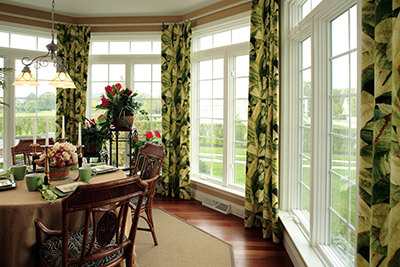 Your casement windows in Chicago need to perform flawlessly during the harsh seasons. Feldco casement windows are foam filled and have a multi-chamber construction that maximizes insulation. The argon gas-filled glass greatly improves thermal efficiency. The fiberglass reinforced frame and locking system enhances strength and increases energy efficiency by keeping the elements outside to help lower your energy bills. Made from vinyl, our casement windows require minimal maintenance as they won’t rot, warp or expand. You won’t need to worry about repainting your casement windows either because the color you choose is baked into the frames during the manufacturing process. 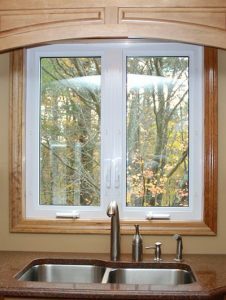 Where Do Casement Windows Fit Best? Since Feldco casement windows are so versatile, they can fit almost anywhere in your Chicago home. However, their ease of use often finds them in kitchens over counter tops, in hard to reach places or wherever you want more sunlight and ventilation.